Introduction:Game of the Year, Game of the Year; I kept hearing this title bestowed upon this game. I however had never played this supposedly superior gaming selection. When the game showed up on Steam, and was on sale for $2.50, I told myself. “Even if it fails at being great, it should be $2.50 good.” With that I bought it. To say I irked out $2.50 out of a game I spent over 12 hours completing is a little bit of an understatement. I beat it on either normal or hard. Now, I find that my reviews tend to be more like designer documents, commenting on what works, and what doesn’t about many different aspects of the game. Therefore they often contain spoilers. You have been warned. I know there is a story to this game, but it is impossible for me to tell you exactly what it was. It has startling complexity, with many different organizations and terrorist groups exerting their influence on the game's world. 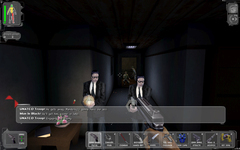 The main plot however revolves around JC Denton, one of the first augmented humans. Augmented in the sense that rather than mechanical advantages by implants; these humans have nanotechnology in their body that can change to fit the environmental need seemingly at will. JC Denton begins his journey working for UNATCO, which is a company that is seemingly bent on stopping terrorism. Their adversary is the terrorist group NSF. 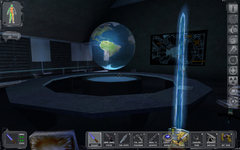 The first few missions of the game have the story following this basic line, but soon many more companies are introduced, alliances broken, and characters added. The story is written like a novel and doesn’t seem toned down at all for the gaming audience. In a way this is very good, it fills the world with lore beyond what might be seen through one playthrough. Information on the story can be obtained through a number of ways, newspapers, data pads and NPC's conversations. The story lore, while usually not needed for playing the game, fill in expansive backstory. For example, while I initially read many of the newspapers throughout the game, I soon found out they were not mission critical at all. Therefore, similar to the Bioshock recordings, I either chose to ignore them with minimal loss in gameplay or quickly skim over them. In my opinion, the plot becomes very deep quickly. Keeping track of one terrorist group was easy enough, but then having Majestic 12, FEMA, VersaLife, and a number of other protagonists: Bob Page, Tracer Kong, etc. quickly left me confused. Not to mention, stopping during the adventure and coming back later on left myself trying to remember why I’m being contact by one of these many beings. The basic premise of what I was doing at each mission seemed simple enough, download this, infiltrate that, but I didn't connect with the multitude of characters. Too many names, not sure why I should do things for any of them. This caused me to not want to stop playing the story aspect, as I didn't feel a driving force besides the gameplay itself. Those who are deeply entrenched with the story may enjoy following the complexities and subtleties of the plot, but I was not so drawn in. I'm still not sure why some things happened. Luckily, the augmentations granted later help break up the confusion with changing gameplay by which to entertain, but it doesn’t make the story more captivating. The storyline is linearly based, yet one of the game's best attributes in the choices the player can make. 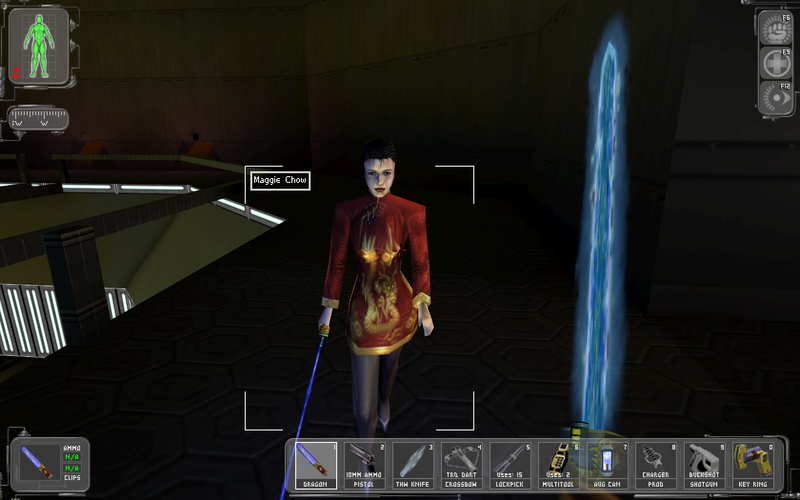 There is enough semblance of choice so that the player may play through the story again to see other choices, such as one would do for dialogue trees in Mass Effect. Of course, there are also more substantial changes depending on the player’s actions than just another voice clip. For example, big spoiler here, JC can either save his brother from dying or not, doing so yields not much difference in the conclusion of the game, but does allow for the brother to pop up at various points past that event, offering reflection on his survival. The developers have done the story well too, so that when the brother does stay alive and show up, his locations and speech do not seem out of place. It feels like an actual plot changing possibility. This felt much better than Mass Effect, where Shepard had to choose which one of his allies would stay to die on the planet to detonate a nuke. In that game, the ultimate conclusion has no large effects at all, just the loss of a teammate, and dialogue right after the event, though not sprinkled through the rest of the plot. In both game examples provided though, the outcome is still negligible. The early portion of the game is a testament to choice. In fact, it is a shame that the developers were not able to carry through the rest of the game with how well designed the first few levels were in their ability to give the player a sense of control over the actual objectives. 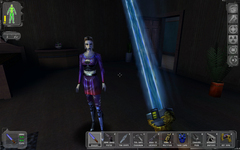 In the later game, JC is forced to complete objectives to advance the plot. Not so in the beginning. 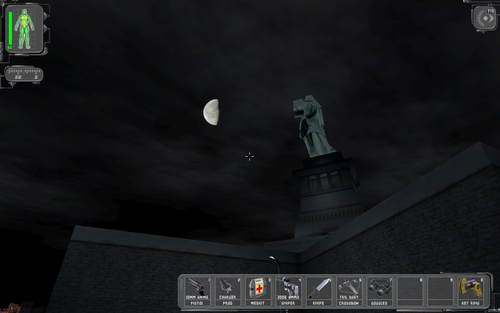 When I played through the statue of liberty level, I never rescued one of my fellow agents, and I killed the terrorist leader against orders. To my surprise, my boss later rebuked me for doing both, deducting my pay on the missions. If I did everything correct on the mission, my boss might still debunk me for entering the women’s bathroom back at headquarters. These events impressed me greatly. “Wow”, I told myself, even some recent games don’t pay attention to those little details. The second level has much of the same, I never found the ambrosia shipment I was supposed to find, and I killed a bunch of hostages in the subway. The game recorded those things, with the boss further angry at my inability to perform my mission objectives. These things seem minor, but I loved my sense of choice. 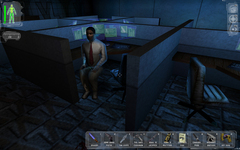 Even little details were not completely overlooked, Walton Simons, who is one of the main antagonists, tells the player to buggeroff when he is interrogating some hostages at the UNATCO headquarters. If the player chooses not to, Walton Simons will comment on that fact near the end of the game. It is rare in FPS to feel as though my actions or even inactions have influences that decide details, however minor, to the overall construct of the storyline. Like I mentioned though, these choices quickly drop off, and is one of the reasons I became more “bored” with the game as I progressed. Later on, my ability to change the plot was minimal, and I felt like most of my choices to affect the story had been extinguished in the early game. Note, choosing to kill or not kill people is a “choice” but is not something I would consider more compelling in Deus Ex compared to every other game out there. The consequence of killing most characters is about the same as if I chose to smash a crate open or not. Like Oblivion, the game won’t let you kill mission critical NPCs which makes for discordant thoughts of the strength of the human body when it remains standing after coming in contact with a rocket. Interestingly, the game suggests not killing everyone. 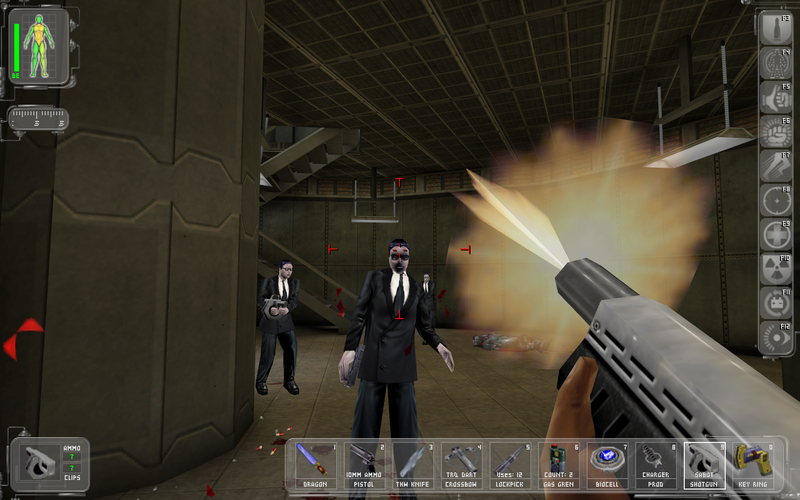 The player is granted non-lethal weapons, and almost every enemy can be subdued without killing them. Sadly, there are only a couple portions of the game where NPCs actually comment on sparing lives, and they all occur within the golden 1/3 of the game, filled with its many actual choices. On that note, there is one portion of the game where the killing of usually mission critical personal IS allowed. This part, where Anna Nevera, one of UNATCO’s fellow mechanically enhanced humans, is holding an NSF leader at gunpoint, seemed one of the biggest morally unguided portions of the game to me. Similar to skipping mission objectives, the game doesn’t tell the player that they can kill her, but you can. This is amazing, and really gives the player that final sense of control, before the game begins to run mostly in autopilot. If you choose not to kill her there, probably because, like me, you didn’t know (or were too weak to do it) you will have the chance to kill her at a later time. Sadly, at this later time, despite the fact you can glitch your way around not killing her, the game forces you into the position of killing her. If you happen to glitch past her she will not make another appearance, and the game plays as though she died. Not all choices were well designed, I was especially disappointed by the ending to this game and the choices available there. The endings mattered little on JC’s compounded actions through the game, and indeed he could choose an ending as easily as flipping a couple switches. JC chooses who he wishes to ally with by just following their advice on the very last stage. I chose an ending by accident, Everett’s advice, unaware that I was beating the game with those actions. Also, Deus EX does not allow JC to side with Bob Page, the “evil” antagonist, who I would think that in a supposedly free choice adventure like this, would atleast be an outcome. Who cares if he’s evil, I want the choice! The GUI also takes inspiration from traditional RPGs by allowing a quick selection of items, available at the bottom of the screen, and on the side. 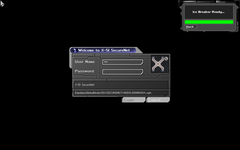 Augmentations are highlighted on the right side of the screen when activated, using the F# keys. Up to 9 inventory items are hotkeyable using the number keys. 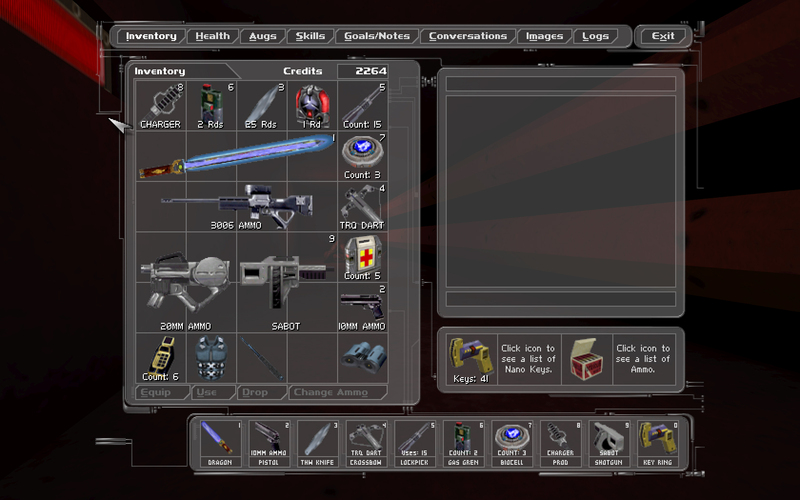 These items can be specified to items on the inventory screen. It is also possible to activate Augmentations through one’s inventory scene, but I never used the feature, and seemed to be there for those who like to micromanage every second of their bioenergy. An interesting innovation for Deus Ex that I have not seen in any game that have succeeded it is location based damage that affects the player’s abilities. For example, losing the player’s legs prevents them from jumping or moving quickly. (The game says that agents in the field will be terminated if they lose both legs, but this doesn’t happen. Instead, if you cannot get a healing item and lost both legs, you will probably have to restart the game.) There is no explicit total health bar. 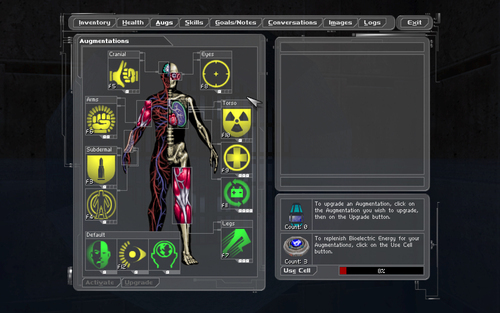 A wireframe, similar to Starcraft’s, of the player on the left side of the play screen shows the conditions of each body part, from a healthy green glow, to a dangerous red. 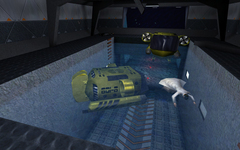 If the player’s torso fails, the player will die regardless of the conditions of the rest of his body; Important to consider, as radiation and electrical sparks usually target that portion of the body. This GUI element also houses the bioenergy meter and a useful compass. Besides NPCs giving out information by mouth, there are also datapads, and newspapers. The game does not force the player to “read” any of these things. In fact the developers made it quite easy to access data pads, just to have the vital bits recorded to the player’s Conversation/Log menu. The player’s Conversation/Log tab under his inventory is perhaps the best feature of Deus Ex, for without it, the game would have required a pen and pencil and, to tell you the truth, I would not have completed the game. There are just too many login codes, passwords, and conversations to keep track of, not all are necessarily needed to complete the mission objectives either. Players can delete notes, which I never did, or they can add their own. The ability to add the player’s own notes was a nice feature, but one that I didn’t really need for anything, since the game does a fine job chronologically storing notes. Perhaps good for those who dropped items in a location and wished to note to themselves where the items were. It is too bad that there were more sorting features of the logs, such as sorting by passwords only, or user-created notes, but even without this navigating them wasn’t too much of a pain. The most vital and recent notes were usually at the top, and rarely were notes used from missions besides the current one. Besides adding notes by oneself, players can also tag points of interest collected images. While cool for a military strategy game, or an RTS, I found it to be of limited use. Tagging people’s pictures? Eh? Facebook in 2000? This is not to say I dislike the feature of being able to tag images; I enjoy anything developers do to increase a players freedom without clutter. The issue is more that the game doesn’t give out images that are useful to be tagged, or the system isn’t robust enough. The images provided by the NPCs in most cases were either self-explanatory, or were maps of greatly varying usefulness. I could see the need to tag where personnel were on the map, but I felt this was more work than should be required. The game lacks an auto-map, which I think was a mistake. 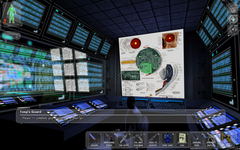 In the futuristic setting of Deus Ex, I would think that atleast constant top-down satellite footage would be available to a nano-augmented human, not just helicopter snapshots, and video hacked from a building’s camera. I can’t draw on the provided maps either like Myth or Alien Swarm, so charting paths is cumbersome. Furthermore, since maps for all locations were not provided I ended up getting lost when navigating to places that I am told to explore. Following good design practices, the developers added landmarks, but this necessity could have been suppressed more with a proper map system. A player-self tagging system would even have been a useful ally. Tag where enemy are on the map to avoid them, or atleast tag where the player is currently. 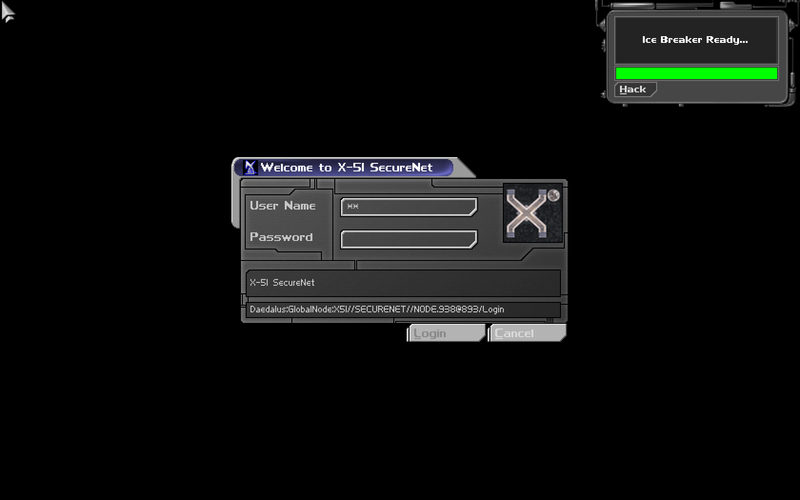 When the player goes up to a computer terminal, they have a login screen. Assuming their hacking skill is trained, they are also able to hack the device. Hacking is boring. The player hits the hack button, waits a standard amount of time depending on their training level, and they are into the system. The continually dwindling countdown timer shows the remainder of the hack time and terminal access. If the terminal access time through the hack is exceeded, the player’s bioenergy will be drained completely. Improving the hack skill supposedly increases the time until lockout, but I usually had enough time to do everything the terminal provided in the time I had left. The only exception was the reading of e-mails, which usually contained nothing vital to the mission. If they did had something of importance, my log would contain it later. Therefore, the whole computer hacking, accessing, bit of Deus Ex feels empty. 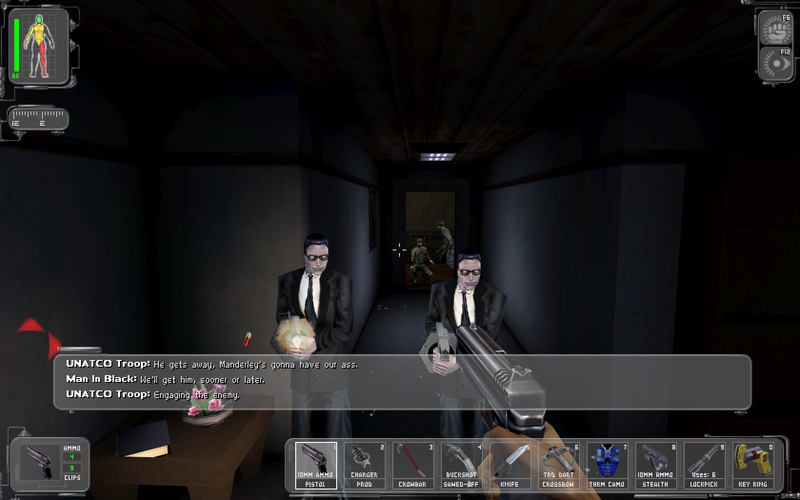 Timesplitters: Future Perfect had an interesting take on computer access, complete with a mini-OS and that felt more active and full-fledged, despite being used only on a single level of that particular game. Besides hacking being un-interactive, it is also somewhat required. Without it the game forces you to find login information laying around, and this could be anywhere on the level. 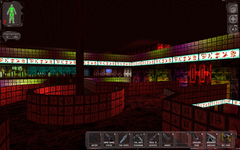 It is much easier to just spend a couple skillpoints into that basic hacking which lets the player do almost everything the terminal or computer provides, the absence being player controlled turrets. Furthermore, the game seemed against typing in the user-names and passwords since, despite them being in your log, you cannot access both the terminal and your logs at once. This forces you to depend ultimately on your memory, or a handy piece of paper. It would have been greatly appreciated if the developers had provided a screen where the compilation of login information could be accessed on the terminal screen. Alternatively, the hacking should be instantaneous as JC already HAS the information needed to login, so why would hacking even require millions of test permutations? It is unfair for me to judge the game’s graphics. For I played it with the assistance of a DirectX 10 renderer, which wasn’t even out when the game first was released. However, since that renderer did not change the character models, nor textures, nor style, I can still comment on those fronts. From what I have seen of other games during the same year, and the years before it. It seems that Deus Ex was slightly behind the graphical curve. Luckily, I feel this hasn't affected the game too much, as it seems to accomplish everything it wanted to do with the graphics it had. I felt the game’s graphics were surprisingly good. There isn’t any bump mapping, or advanced shadowing and lighting, but the game still holds up. Textures have fine details on them when viewed up close, such as the interlaced bands of a television monitor, or the graininess of a wall. The textures are so good, that they even seem to surpass some modern games. Sticking my face onto a wall in more recent games will often confront me with a muddled cloud of color, baked lighting and an overall lack of detail. But in Deus Ex, even in close proximity the details keep their composure for the most part. This does not hold true for the textures on the character models, which do appear blurry and remind me of N64 games. But atleast for the world that JC explores, the textures never put me off as low quality for the time. I must give credit to the new renderer though, since I’m sure atmospheric filtering did help in warding off such blurriness at long distances. When textures are viewed up close, I think my comparison is fair, where the filtering is limited in its usefulness. 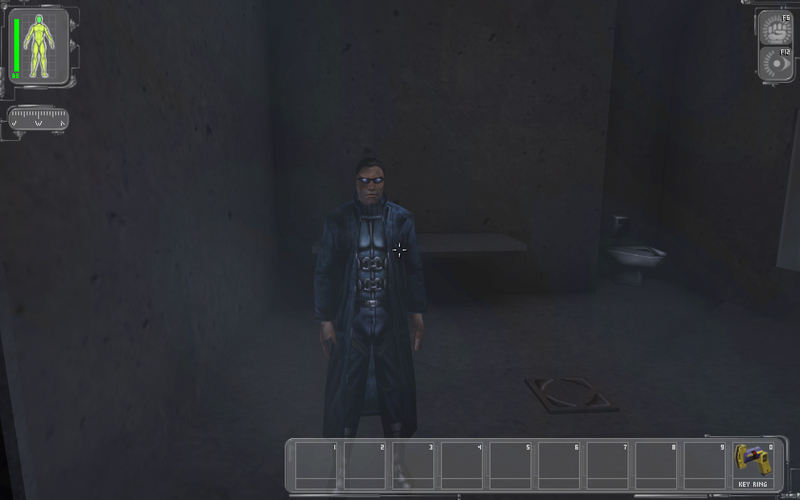 Deus Ex takes a somewhat cubist approach to both level design and character model. The world is not made of completely right angles, Chamfer and sloping do exist, but are not used to eliminate the look of blocks completely. The game carries off this style of blocks surprisingly well in the architecture of buildings, which are usually squares anyways, it is the various objects in the world that feel low quality. For example, a basketball in the game looks more like a oblong diamond than a round ball. Furthermore, Characters have rows of teeth that are squares, fingers are cubes (ala The Sims), and water coolers are pointy. These thankfully do not detract from the world too much, since the texturing is capable enough of adding details where the polygonal rendering could not. Yet, rounded edges will be pleasant to your eyes when you leave the game. When Half Life 2 was still in production, I talked with some of my fellow co-workers about it. One was extremely hyped about the game, saying that players would be able to destroy walls with rockets, anywhere they want to create a path. When I played Half Life 2 I was disappointed to find out this was not so. The world was sterile and the only objects that were destroyable were bottles, cardboard boxes, and specially pre-programmed events. Sadly, 2001’s Red Faction had a more truthful realization of a player pathing their way with destruction. 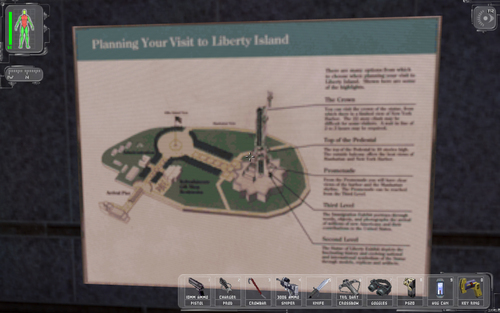 Playing Deus Ex, I found another gem of world destruction. Unlike Red Faction, you can’t blow holes in walls, but the game has many other things to blow up, both for strategic or nefarious purposes. For examples, to proceed through a locked door, forget having to pick it, or find a key, just attach a LAM explosive to the door and bust it open. 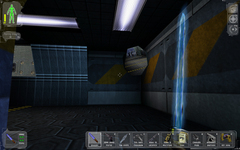 Nearly every door, besides mission crucial ones, can be removed via this design, and it allowed the player another sense of charting ones path. Besides doors, various other objects can be disposed of. Chicken hanging in Hong Kong not your type of beef? Smash it. Boxes in your both, dematerialize them. Glass windows? Gone. 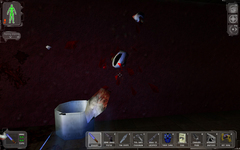 The player can also destroy bodies. This is for those people who are moving over from Quake, and wish to destroy their fallen enemies’ corpses for their masochistic ways. I suppose it will also prevent guards from finding bodies, but given the stupid AI, I never tried it. Whenever an object that is destroyable is hit, it will turn a darker shade of gray, until it becomes black and explodes. This is a simple, but effective mechanic of showing how much damage something receives. It also has the bonus of informing the player if their attacks are doing any damage, since unlike doors, objects do not have apparent heal meters, and it isn’t until the player is strong enough that their attack may do any damage at all. 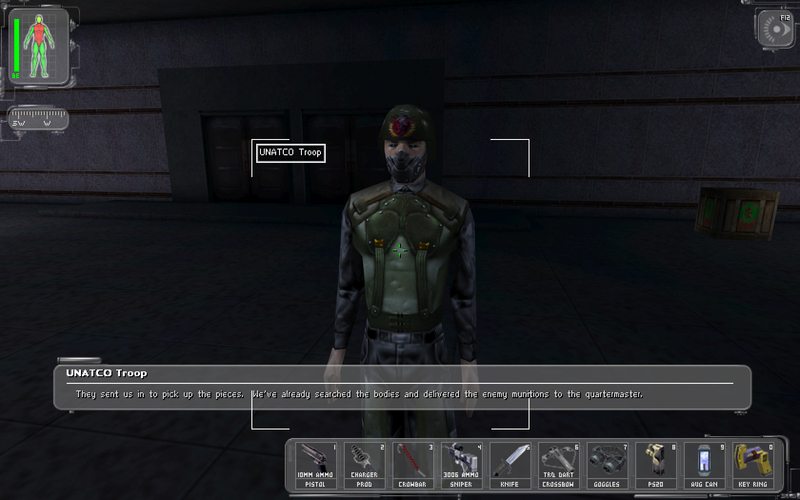 Deus Ex is all about choices, or a semblance of choice. Choices of who lives and who dies, and choices of how to carry out mission objectives. Do you plan on sneaking your way past the guards, or would you rather kill them all? But how would you kill them? Would you dispatch them with their own turrets, move up close for a crowbar to the back of the head, or might I interest you in a fine sniper rifle with that? There are many ways to do things and this is the game’s biggest draw. When I played through the game I choose to have JC specialize in Melee weapons and pistols. I would sneak up to people and bash their bones to make my pleasure but if that failed, I could shoot my pistol to finish the job. However, it was gun combat that showed a major weakness in the game’s formula. Guns are not accurate. JC must not move so that he can aim properly. While this may make sense for some of the larger weapons, such as the sniper rifle, it doesn’t feel correct for small arms like the pistol. Furthermore, even if JC stands extremely still, and the crosshair focuses to its maximum extent, showing maximum accuracy, the game will still not make it a perfect shot. Consequently Deus Ex is not a run and gun game. Any attempt to do this will usually result in the enemy having the upper hand (atleast until JC receives augmentations). Even towards the end of the game, when I had maxed my pistol’s abilities with upgrades; a laser pointer, increased range and more. I could still not use it as one would in Counterstrike, running and shooting. Sadly, this lowers the “choice” element described forcing the player to adopt a crouch, go, repeat. Thankfully melee was unscathed in design. A hit is a hit, and there is less of a dice roll of getting a shot off that kills. The game is an RPG, and so consequently, JC has skills that he can build up and specialize in. As I mentioned before there are melee and pistol skills, but there are also heavy weapons, computer hacking, and many more. 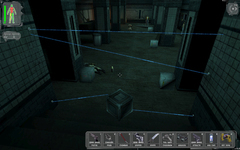 Skill points are earned through progressing through the story and discovering locations, so the game doesn’t force the player to kill people. Except that, having killed so many people, or atleast knocking them out, I was not rewarded for my skills at all, so I’m not exactly sure why they are “skill” points. One would assume that I would become more skillful from use of my pistol. Instead, I can visit a hotel and magically know how to use it better. I would have wished for some “reward” for my hands on-ness. I guess that the developers did not want the players that took the forceful, rather than stealth, approach to be rewarded too quickly by grinding their skill points. Through this way, the allocation system is somewhat of a weakness, though it does increase the player’s ability versatility, choosing to perhaps specialize in another secondary skill without putting effort into directly training it. 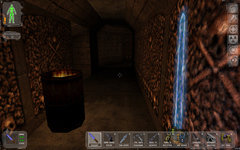 Because the game does not force, though it does hint, the player to play a certain way, the developers had to accommodate paths for the unskilled. This was another neat addition to the game. For example, there are generally two or more paths through any situation. One path may have the player, strong in swimming, swim through underground piping to infiltrate an area. 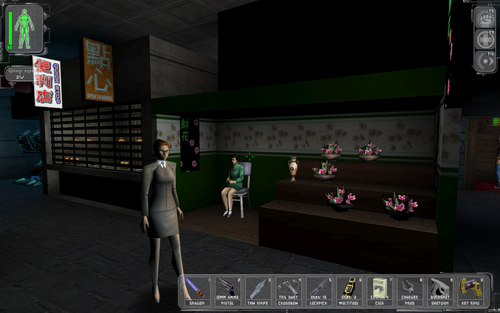 The other may force the player to fight more enemies directly. Similarly, some paths may involve disabling security systems or traps, which those who are unskilled in demolitions or computers would have problems bypassing. They can however, take the front door and liquefy some people though. I like the choice of the paths given by the developers, they kept things fresh, but did add some confusion. I would traverse one path only to go down one of the other skill tree specialized routes, and end back where I started, losing time and more resources than needed. A minor plaint, which’s benefits outweigh the annoyance. You know, if I had that auto-updating map, or even a mini-map though, the backtracking by accident would probably have happened less often. Deus Ex has a couple different weapon types, but not too many varieties as one would expect in an RPG. I.E. One sniper rifle found is the only sniper rifle found. There are two pistols types, and one machine gun. Etc. The weapon selection that does have the most variety are the melee weapons, probably due to their inability to be upgraded. Due to the limited weapon types, they have some special features that other FPS do not have. For one, in the essence of an RPG, the weapons can be updated with state modifiers, but as I mentioned they didn’t seem to make a big different to me. (They will not make this a pure FPS no matter how many upgrades for weapons are procured.) A weapon’s range determines how close an enemy has to be to “target” them with the ridicule for increased accuracy. The bullets will travel large distances even without proper targeting though the chances of hitting the target are slim to none. There are also upgrades to decrease reload time, no Gear of War-esque action key to speed reload. In addition, the weapon’s capacity for bullets can be upgraded, for times when one does feel like having a firefight. As far as I could tell, weapon damage was determined by skills, and not by upgrades. 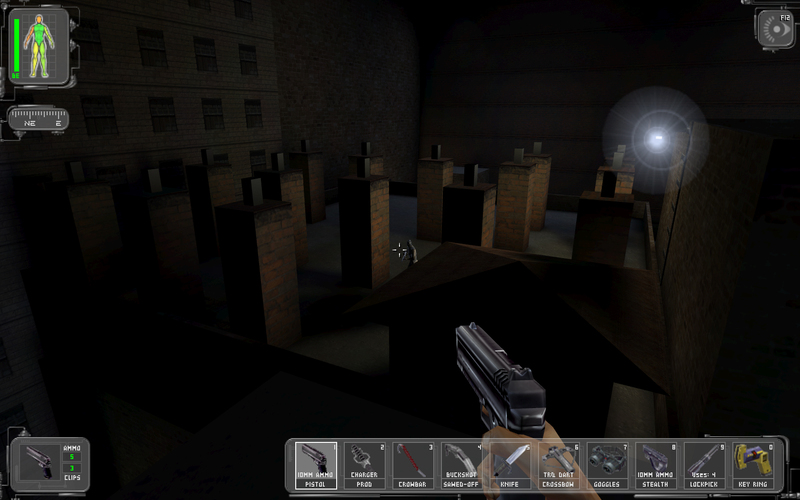 The player may also choose to change the ammo type in the weapon. If a robot chooses to clank on by, the player could load up some Sabot bullets in their shotgun, while traditional bullets would be just fine for the normal troops. For the tranquilizer crossbow there are also some different dart types some to knockout, some to light up the area etc. These different bullet types are an interesting touch, but most players will probably only use different ammo types when they run out of the former. 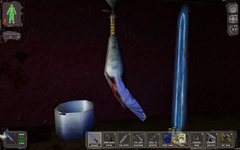 Inventory management captured the essence of the likes of Resident Evil 4, or Dungeon Siege, where the items picked up through the adventure take up a limited space in the inventory. Since there are not too many items in the world of use the non-expandable inventory is usually sufficient. Also, picking up more of the same item stacks them, allowing one to magically carry 5 cans of soda, but perhaps not have room for a pick lock. Not all the items in the game make sense for the space they occupy. 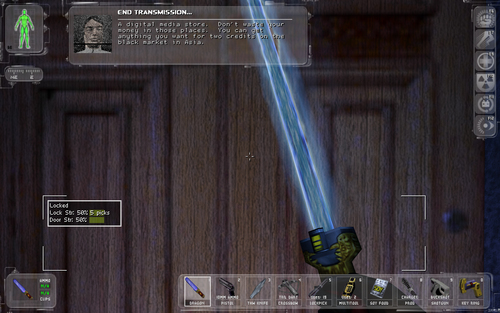 Lockpicks are bigger than soda cans and pistols, and a beam sword acquired through the adventure, which lights up like a lightsaber when equipped, still takes up space in the inventory as though the sword were ignited the entire time. 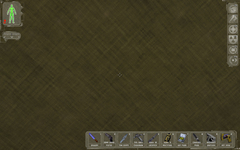 The inventory is also highly simplified, one cannot rotate objects to make them fit better. Thankfully, this is usually not required, I only once remember needing to move objects around to fit another item. Instead, I have qualms, not with the inventory system, but the item pickup system. See, to get items off dead bodies, you need only to right click on their body and JC will strip search them of all their goodies. 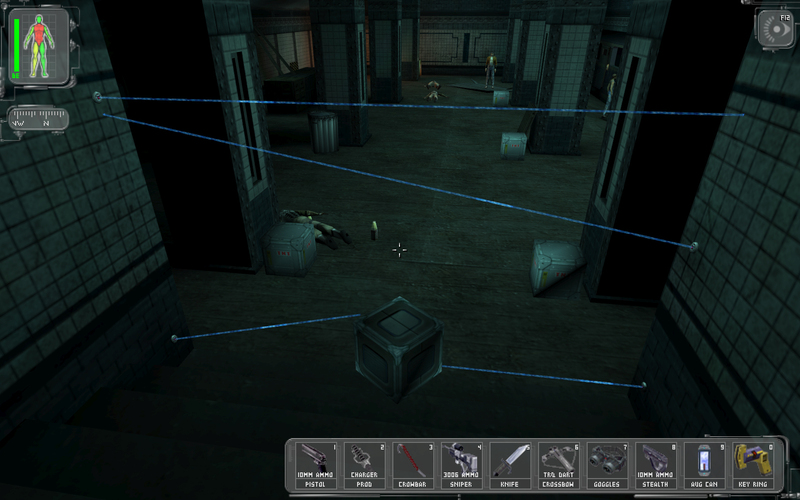 Unlike most RPGs, no inventory dialogue box comes up, and it keeps the pacing fast like a traditional shooter. Unfortunately, it means I pick up every knife I find, even though I’ve ditched the last 5. I’ve kept my inventory full to avoid this annoyance. Cannot pickup knife? THANK YOU. Here’s a tip to all you developers out there. It makes sense to automatically pick up items that the player already has. He is carrying around 5 sodas? Add another, if it stacks no problem. He is loaded out with this one type of ammo, obviously he is using it, so give him some more. For these situations, no problem, screw the dialogue box. But for everything else, it is probably wise to bring up some choice of the player if they want that item or not. If they do want everything, there can be a take all button, like Morrowind. Having to drop the same items till the end of time is ridiculous, especially since I must open the inventory, and then find suitable space on the ground to drop the item. The Crysis before Crysis was released, a spiritual predecessor. You want super strength? Get “Combat Strength” and bash open doors, and pop people’s skulls with your melee armament. You want to Jump high? Get “Speed Enhancement”. To get these though, JC must find the Augmentation containers around a level and then install them using a medical bot. They can be further upgraded using upgrade augmentation containers, though these do not require the use of a medical bot. I found it odd why a medical bot was needed for one and not the other. The game makes it seem like the upgrade containers contain more efficient firmware, so to speak, and so are easily integrateable, but I personally think they should have been installed through the medical bot also. I spent some time trying to find out why my upgrade augmentation containers were not showing up as available to install on the medical bot screen until I realized you could just install them through the inventory. I think the game could have made this clearer, and atleast go with “logic”. Augmentations are the game’s bread and butter. Without this, I might have stopped playing it halfway through. However, I wanted to see what other augmentations I would find, and turn myself in the super-human I was supposed to be. And let me tell you, once you get enough of the augmentations going, JC is truly a killing machine. He can destroy missiles in mid-air, see in the dark and through walls, he can dispatch a tiny investigative prob, he can pick up huge objects and more. I felt a bit like Neo from the Matrix will all the special abilities, and it was better than some Matrix games out there. 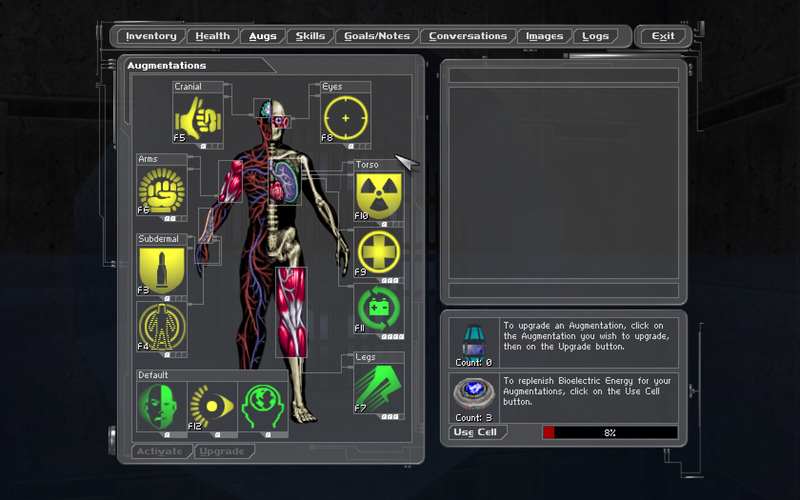 Many augmentations can be chosen and activated at once. 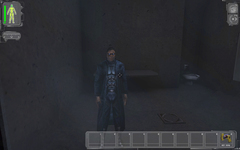 The augmentations come in pairs, two per container, though only one can be permanently chosen, the other lost permanently, so the player must investment wisely. Using Augmentations requires bio-energy. Bioenergy can be recharged using bio-cells scattered around a level. These are useless at the game’s start, but at the end, they are more precious than health packs, since the player can heal quickly with an augmentation later in the game. This bioenergy teaches conservation, though spurred by intensity, often used it all up quickly, leaving myself with boring, weak and slow JC. The AI is average to retarded, in the strictly psychological sense. The enemies care little for cover and seem to have primarily three modes of function. Patrol; where the enemy will follow its programmed walking and exploring path, Attack; where the enemy will fire at you, and if out of range, will run to find you, and retreat; where the enemy will run defenselessly from you. 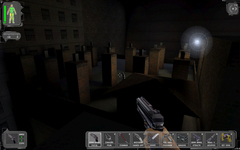 Patrol is under the map maker’s direct hand, and the patrol routes on most of the levels are good, the enemies do not get stuck, and are made to give JC possibilities to get into position to attack or sneak by. Attack is where the poorness arrives in a black van with tinted windows. The enemy will fire and strafe you until you leave their sight. The next part is the predictability. They will then usually rush your position allowing you to predict where they will come from. Either that, or they tend to roam around the level helplessly, where you may find them later, wondering how they got there. Worse, the enemies seem to forget where you went very easily. You just need to run behind a shipping crate and crouch out the way, and they will quickly give up. “I guess it was just my imagination.” Really trooper # 467? The intruder alarm could still be blaring and the enemy will just go back to standing around normally. Storytime! On one level I was hiding in a basement area. I crept up a floor to find a bunch of guards standing around, upon seeing me they started to rush around and fire their weapons. I retreated into my cave. Some of the enemies chose to charge headfirst. Due to their numbers they could overcome me, but that was about their only strategic advantage. This also made laying traps, and throwing out explosives quite effective. After I dealt with the attackers, I went back up a floor, and found that to “look for me” some of the enemies had run up another level of the building. They then began to rush down to attack. Sometimes, to gain the advantage against the enemy, it is as simple as hiding behind some boxes and taking pot shots. Considering that this game was made in 2000, I shouldn’t assume that AI technology would impress me much, except this is the kind of behavior I’ve seen in 1990s games. As for the AI’s retreating, they will do this when they have taken a nearly fatal amount of damage. They will drop their gun and run off. I assume that they will never turn back to killing you, since they appear to go stand in corners, but I’ve never let one live to find out. The AI of the robots is superior to the humans, but this is a byproduct of them not having to prove their sentience, and they be superiority tactically equipped. A huge robot has no need to charge you and so will keep on its patrol route, dealing fatal damage if you choose to rush it. Sound for this game is below average, but the voice acting is definitely better than average. Every character interaction is voice acted, which beats out some RPGs, such as Morrowind; which only had partial voice acting. Most different characters have uniqe speaking lines too, so two civilians would say diverse things instead of being cookie cutters of each other. No overflow of Nolan North here. 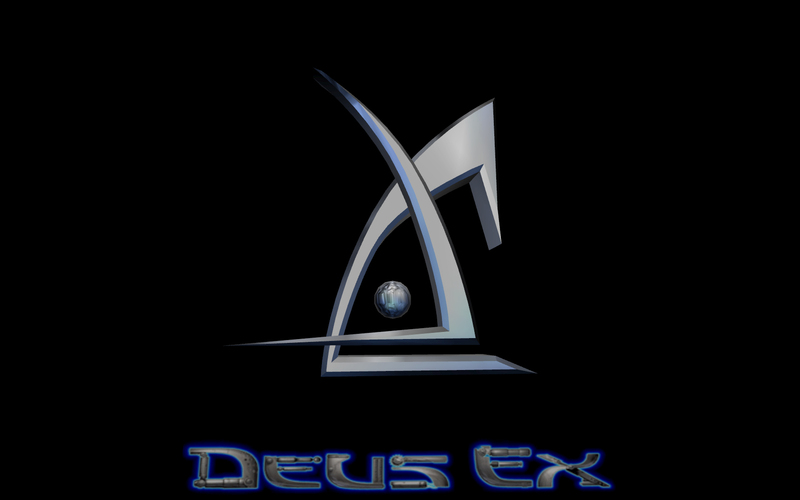 Considering there are so many characters to voice act, that is another detail that makes Deus Ex noteworthy. Furthermore, even for the year 2000, the voices do not sound like they are being spoken into a microphone, and are clearly pronounced. However, unlike Chronicles of Riddick, there are not too many witty lines to go around for the Guards. Throughout the entirety of the game, the guards will have bored you with their repetitious responses to your presence. However, this is overlookable for quality of the non-guard lines. At some point in the game JC will come to Hong Kong. Other reviews of this game have said that the accents for the characters sound extremely fake. For one character I must definitely agree on this mark, the newspaper lady sounds like she is trying too hard, but for the rest their voices and tone didn’t distract me enough to remove me from the setting. I assumed that due to the futuristic setting, with meat marts lying next to multi-billion dollar corps, that the little shops selling flowers and other useless items are a front, and guise to the true be-hind the scenes actions going on in the city. For that reason, it would make sense that the accents all sound fake. The game may not state this specifically, but I’ll just take it like that. It also supports why there would be so much police action in the area, and the freedom of the rival gangs in the area. Sounds were a bit meeeeeh. The game is good with audio indicators of various actions: shutting down of augmentations, a sound for when the key chain works (So you don’t try and hit the key ring over and over), a sound to let the player know when a camera is about to spot them, the sounds of a turret swinging about to shoot at the player, BUT, some sounds are horrible. Picking up a wooden chair or grate and throwing it to the ground sounds like a wooden toy that a child would use. This is also a problem for other pickup-able objects, and strike actions. For knives, hitting a window and breaking it sounds quite good, with the tinkling of glass on the ground, but a knife hitting an unbreakable glass barrier results in what sound like smacking a metal grating under water. Why? I must hate the knife all around because another sound it makes is like a whip. Now I haven’t stabbed anybody in real life, but I can tell you it would be more squish than “woop-ish”. I can understand there not being 5 sounds for each action, since memory was more scarce in 2000, but I think the sounds that were chosen could have been less tinker-tonk. Music was good with some reservations on its execution. The theme of the game, the one that plays on the title menu, doesn’t play much of a part in the initial levels, but it shows up boisterously and mixes itself with level action themes later on through the game, which I thought was kind of cool. That way it wasn’t all up in the player’s face like in Chronicles of Riddick. However, a method by which Riddick’s was superior was its dramatic-ques. For Deus Ex, sometimes the slightest enemy provocation will cause the action variant of the soundtrack to go blaring through the speakers. Get seen by a camera, even with no apparent danger? Action Theme. One weak guard sees you? Action Theme. It switches on too quickly. It doesn’t seem want to want to cooperate with the existing soundtrack, deciding to barge in and raid the metaphorical ear fridge. On Riddick’s front the action music sort of fades in, and was a subset of the level’s theme. While it also had the tendency to jump on, it felt more graceful. There shouldn’t be a technological excuse between the games for this, seems like a styling problem on Deus Ex’s end. Deus Ex is a first person shooter/RPG hybrid with more focus on the Rolepaying aspects than a traditional first person shooter. It has a complicated plot which may scare off those who are looking for movie-style cinematic first person shooting experience. Also, the game’s length is more detrimental than advantageous, as the player is whisked off to locations that seem to drag the plot out. However, the game is exceptionally good in its sense of player choice, allowing multiple entry routes and solutions to puzzles. While the player’s choice in the main story arc is limited to a few choice opportunities, these opportunities stand out from other games in the genre as having noticeable changes in the storytelling, though not the conclusion. Sadly, the multitude of these choices happen within the first third of the game. Voices are good nevertheless sound barely squeaks by as acceptable in some situations. Music fits the emotions of the game, but breaks it too quickly for action encounters. The user interface is intuitive and gives the player the ability to be a detective with notetaking and image collection, though the use of paper maps for a player worth over a billion dollars makes the governmental bodies seem like idiots. Overall, I would recommend this game for those who like a story, and also wish to experience a game that allows the player to specialize in their own skillset and still succeed. The save games for this game are HUGE. I saved over 200 times, granted, but I wasn’t expecting my save games folder to top 3.64GB. That’s larger than the entirety of the game which is 2.4GB. Couldn’t they have used form sort of compression mechanism for save games? A little bit of extra load time wouldn’t be too concerning, especially since in 2000, there is no way that 3.64GB would be small change when harddrives were about 60GB at that time. I compressed my Save Games Folder using the Best RAR compression scheme and it gave it a 1/3 compression ratio, which while not perfect, is still much better.